Luton Town attacker Elliot Lee has been named the Sky Bet League One Player of the Month for November. Lee scored five goals and made another with a delightful clipped pass against Plymouth, but it was his footballing intelligence which stood out most. He possesses an uncanny knack for arriving in the box at exactly the right moment. Speaking about his win, Lee, who is the club's top scorer with 10 this term, said: "In this team, wherever you play, you’re going to get chances. It’s good to be top scorer despite not playing as an out and out striker. "I like to think that I am a natural goalscorer and this month I’ve found myself in the right place at the right time, so I’m happy with how it’s going at the minute." 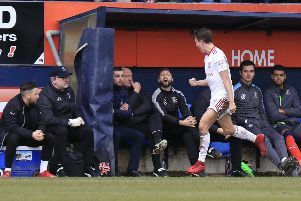 Luton manager Nathan Jones said of the player he signed from Barnsley in the summer of 2017: "I’m delighted, I’m absolutely delighted with him, because for me, Elliot’s a different player to when he came here. "That’s a credit to himself and also the people here, because one, we’ve given him a platform, but his mentality’s different from when he was here originally. "He still has that real selfish goalscoring streak which is for the majority of the time very, very good, but he’s at the level now where his work-rate is phenomenal. "His work-rate for the team, the sacrificial things he does, and then the level of performances have been wonderful and deservedly so. "We're very proud of our work here and the stuff we do, but we often think that especially the players, as I haven’t been overlooked, I’ve been nominated and won enough of those awards, but we feel at times the player have been overlooked. "It’s just rewards and he’s had a fantastic month, but he’s in real, real good form and he’s training at a level, his work-rate is phenomenal so I’m really pleased for him. "He’s shown a different side to him that I’m not sure people thought he had, I believed he had it, he’s really done fantastically well and he’s in great form. "It’s not just for his goals for me, although that is the biggest thing, but the real thing for me is his work-rate, what he does for the team and he’s added that to his game, I’m very proud of him I really am." Sky Sports’ EFL pundit Don Goodman added: "Able to step out from the shadow of his brother and his dad this season, Lee’s incredible form has coincided with Luton finding their collective feet in League One.